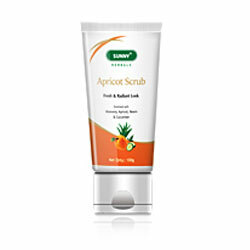 Buy Bakson's Sunny Herbals Apricot Scrub helps get rid of the old, dead skin cells along with hydration of the skin. Deep cleanses to unclog pores and eliminates impurities. Helps get rid of the old, dead skin cells along with hydration of the skin. With remarkable exfoliating properties, this formula deep cleanses to unclog pores and eliminates impurities. Enriched with Apricot, it helps get rid of the old, dead skin cells along with hydration of the skin, thus giving it a fresh and radiant look. Wet face. Apply scrub & massage it with fingertips in gentle circular motion for 2 minutes. Avoid contact with eye area. Rinse & pat dry face.